I saw this amazing car at the Hamsterley Hoppings in 2010 and the owner kindly sent me the information which forms the basis of this page. There is a conflict about the date of the original vehicle, a Vauxhall 12cwt van or pickup. Two dates are quoted, 1934 and 1936. That should not detract from the story too much. This car was built in 1946 to beat the very stringent petrol rationing in force at the time. 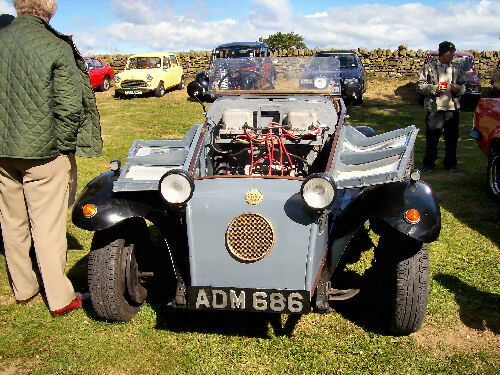 Based on the Vauxhall chassis it was converted for a four seat tourer body using parts from a bomber aircraft which crashed near Ridlen in North Wales. The electric system comprises three banks of 24v each. The motor is 48v and has a built in cooling fan. The two main banks operate with a high/low switch and a seperate switch brings in the third bank.The primary circuits are 6v. The charging is either a mains charger of 110v in the boot or an emergency charger. The original emergency charger was reputed to have come from a Churchill tank, but it now runs with a modern Honda generator. Both methods operate at 24v.. When coasting, a floor mounted button enables the motor to act as a dynamo. Power is through four solenoids giving variable speeds then through a four speed gearbox with freewheel attachment. Reverse is by means of a switch marked 'Ahead' and 'Astern'. Riding on 5.90x15 tyres, this 13ft car has a maximum range of 30 miles at 25 mph. This picture is from a newspaper article and has been photocopied many times which accounts for the quality. There is another early picture which unfortunately I couldn't reduce in size for the website so I've had to host it elswhere. Here is the link.